Each Winter Ale Concert features a rising Canadian touring artist opened by a local performing artist. The intimate performances are held on the Gallery Stage of the Key City Theatre with prime food and beverage service by the Heid Out Restaurant & Fisher Peak Brewing Company - a winning combination for the audience! 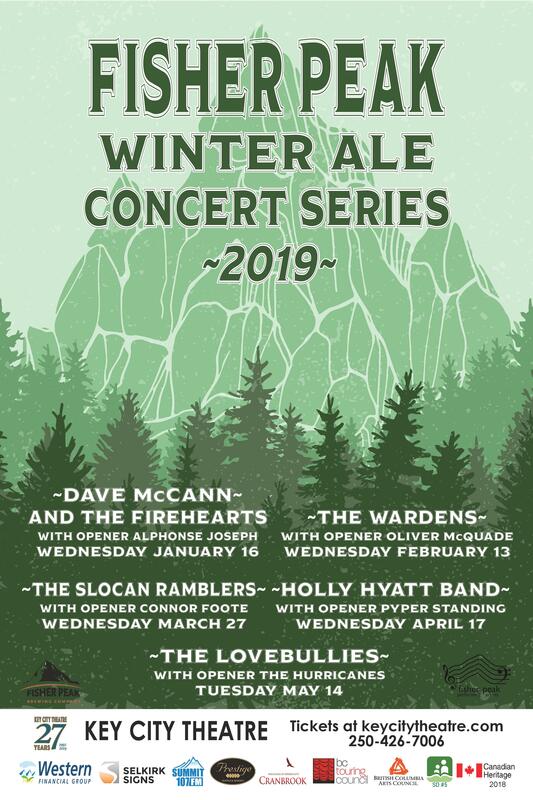 January 16th - DAVE McCann & the FIREHEARTS opened by ALPHONSE JOSEPH February 13th - THE WARDENS opened by OLIVER McWADE March 27th - THE SLOCAN RAMBLERS opened by CONNOR FOOTE April 17th - HOLLY HYATT BAND opened by PYPER STANDING May 14th - THE LOVEBULLIES opened by THE HURRICANES Limited tickets available. $27.5/ticket https://www.keycitytheatre.com/upcoming-events/ This live entertainment series is a collaboration between Key City Theatre and the Fisher Peak Performing Artists Society, and supported by the Heid Out Restaurant & Fisher Peak Brewing Company.